Back before the season began, I visited an Aspen Dental office in Tampa. Aspen is nationwide so I figured if work was needed, they would have access to my records and x-rays. Two cavities were found (bottom right and bottom left) but I postponed treatment. Well, a couple weeks ago the bottom left tooth was starting to become oversensitive so I made an appointment for the office in Montgomery for this morning. Twice I told them the pain was in the bottom left tooth but where do you think the dentist swabbed the topical anesthetic? You got it. The bottom right. That’s where it was marked on the chart. DOH! Tom and me were having our morning coffee outside the Super 8 and was joined by a fellow traveler. He was from Brownsville Tennessee – a small town just west of Mammoth Cave – and was heading to Florida for his granddaughter’s wedding. We touched on multiple subjects and travel was one. I noted that everyone should drive cross-country at least once, given the fact that early settlers made the trip on foot and not horseback as in the movies. 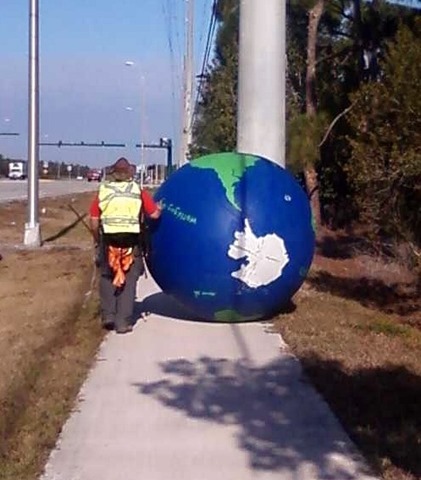 This brought to mind that last year a man was walking south to Florida – through Brownsville – rolling a huge rubber globe. It was his way to raise awareness regarding the scourge of diabetes. I couldn’t believe what I just heard. I ran into the same guy in Hobe Sound Florida back in 2011. He was heading north at the time and we chatted for a bit. This is the way I found him back then and an article regarding his trek. Very small world (no pun intended) indeed. This entry was posted on Thursday, September 21st, 2017 at 4:30 pm and is filed under Uncategorized. You can follow any responses to this entry through the RSS 2.0 feed. You can leave a response, or trackback from your own site.